MR Series -- 1.4 to 2.5 tonnes. 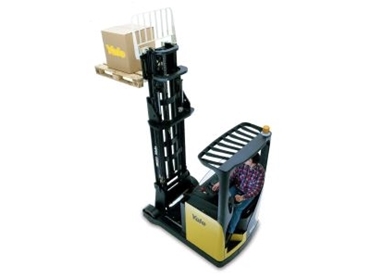 THE new MR Series of reach trucks from Yale offers higher levels of performance coupled with versatility and flexibility. The eight trucks in the range deliver capacities ranging from 1.4 to 2.5 tonnes, in standard, high lift, and narrow chassis versions. Palmtech joystick control, 360 degree steering, ac technology, a performance level selector, and simultaneous lift/lower and reach/retract functions are all fitted as standard. The 360º steering, standard on all MR Series trucks, enables greater driver control and accurate positioning at the rack face. The drive wheel is automatically centred upon start up. All trucks also benefit from automatic speed reduction at cornering and fly by wire progressive steering. A simple on-site modification means steering can be easily changed from 360º to 180º. The Palmtech joystick is standard on all MR Series trucks. Drivers can access all lift functions, forward/reverse and the horn. The joystick is designed to minimise fatigue requiring only minimum effort. A rocker switch enables a quick change of travel direction, and 4 x fingertip controls are available as an option. Ac technology is standard on all MR Series trucks and gives increased performance levels and potentially lower maintenance costs. Delivers travel speeds up to 12km/h. Operators can harness power, switching between high and low power, and there is no variance in performance whether laden or unladen. AC technology extends battery life and requires fewer components. The MR Series is 100% versatile, making it suitable for a wide range of applications and industries. There are extensive options available for tailoring to specific applications and driver preferences. Designed for greater driver comfort with smooth, quiet operation, the MR Series delivers effortless manoeuvrability with 360º steering as standard or 180º optional. Ac motors guarantee easy maintenance, increased power and faster acceleration while the PalmTech joystick provides total driver control.